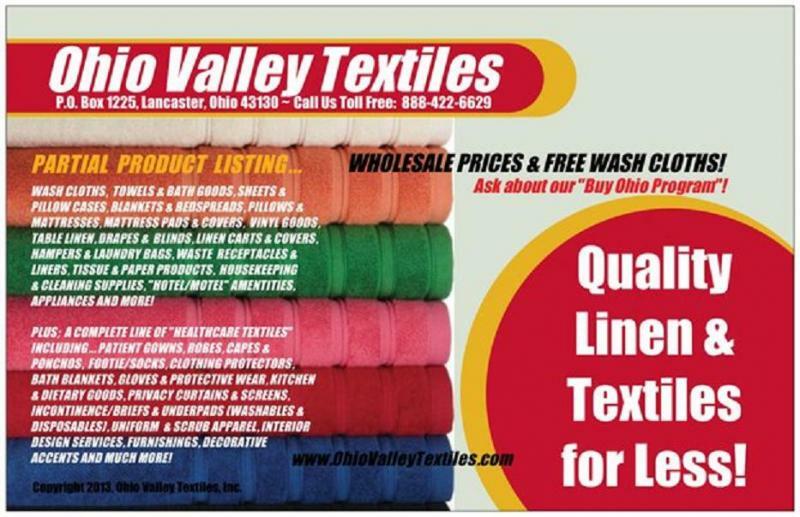 Ohio Valley Textiles - Welcome to Ohio Valley Textiles! At Ohio Valley Textiles (OVT) we provide "Quality Linen & Textiles for Less" to Healthcare Facilities, Hotels & Motels, Restaurants, Spas & Beauty Salons, Gyms & Fitness Centers, Golf Clubs, Pools, YMCA's & YWCA's, Schools & Colleges, State & Government-Run Institutions (including VA's), Retail & Service-Oriented Businesses, Industrial Concerns and Many Others... All over the East Coast, Midwest and the South! Find out how we can help you... Go to our "About Us" page for additional information and give us a call today! IMPORTANT: Our "new" website is currently under construction. Please check back with us again in the near future or give us a call today... Thank you! Welcome to Ohio Valley Textiles! At Ohio Valley Textiles (OVT) we provide "Quality Linen & Textiles for Less" to Healthcare Facilities, Hotels & Motels, Restaurants, Spas & Beauty Salons, Gyms & Fitness Centers, Golf Clubs, Pools, YMCA's & YWCA's, Schools & Colleges, State & Government-Run Institutions (including VA's), Retail & Service-Oriented Businesses, Industrial Concerns and Many Others... All over the East Coast, Midwest and the South! Find out how we can help you... Go to our "About Us" page for additional information and give us a call today! IMPORTANT: Our "new" website is currently under construction. Please check back with us again in the near future or give us a call today... Thank you! At Ohio Valley Textiles (OVT) we provide "Quality Linen & Textiles for Less" to Healthcare Facilities & EMS, Hotels & Motels, Pools, Restaurants, Spas & Beauty Salons, Gyms & Fitness Centers, Golf Clubs, YMCA's & YWCA's, Schools & Colleges, State & Government-Run Institutions (including VA's), Transportation Systems, Churches & Shelters, Retail & Service-Oriented Businesses, Industrial Concerns and Many Others! Find out how we can help you... Checkout our "Products & About Us" pages for additional information and give us a call now - today! IMPORTANT... We have a "new" website coming!! So, please check back with us again in the near future or give us a call now - today! ...Thank you!